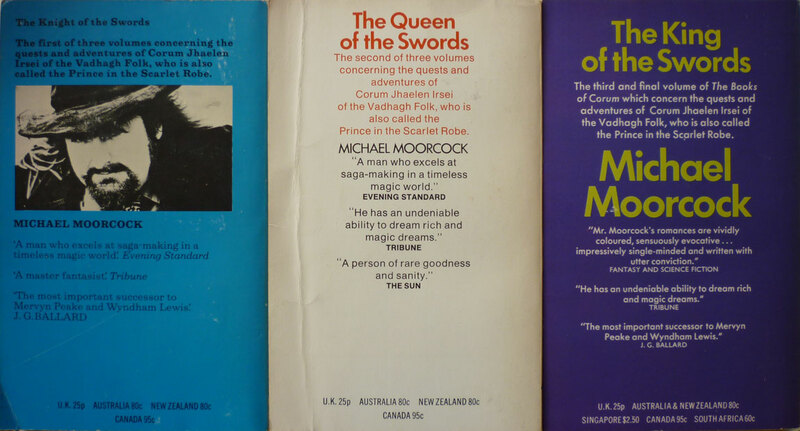 Left to right we have The Knight of the Swords, published in paperback by Mayflower in the UK in 1971 (the copy seen above is the reprint from 1972); The Queen of the Swords, also published in paperback by Mayflower in 1971 (a first edition in this instance); and The King of the Swords, this time published by Mayflower in 1972 (again, mine is a first edition). 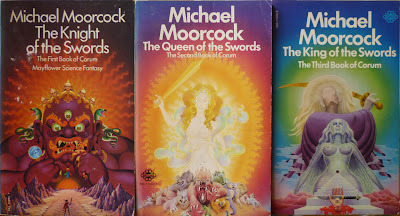 And unlike the previous post, where I was missing one of the books in the Chronicles of Castle Brass trilogy, here I have all three books in this particular trilogy. Well, kind of. 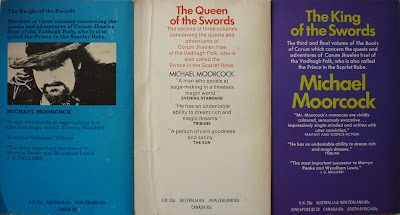 Because these three form The Swords Trilogy, which is only the first half of the six-volume Books of Corum series – which focus on Corum Jhaelen Irsei of the Vadhagh Folk, also known as the Prince in the Scarlet Robe – the second half being The Chronicles of Corum. Although Corum is also an aspect of Moorcock's larger Eternal Champion concept. I've got these three. Found them all for a dollar each at the local thrift store. 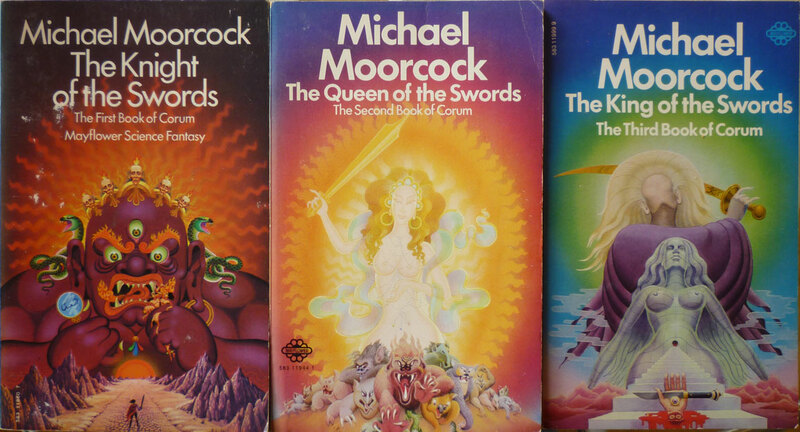 Great covers and for epic fantasy, I really appreciate how un-fat these books are. Slim, little novels where a hell of a lot happens. Nick-how about a post on how you store your many many books? Do you have a warehouse? I have a similar problem. Olman, does that mean you've read 'em? Be interested to know what you thought. Plus there is a shot of my three books. I quite enjoyed them, but found the ending a bit deus ex machina.